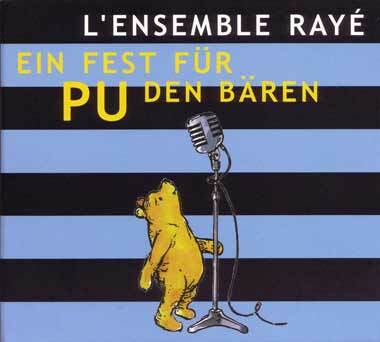 L’Ensemble Rayé’s third (I believe) release is the soundtrack for a Swiss version of Winnie the Pooh. The tunes, mostly instrumental, are a charming combination of innocence and art, appropriate I suppose for everyone’s favorite Zen philosopher plush toy. A rotating crew of musicians play on the seventeen tracks, and eight of them have a hand in composing at least one. Styles range from goofy polkas to lovely multitracked guitars to bouncy (as in “Tiggers are...”) ska to ukulele settings of Milne poetry. The instrumentation is chosen to fit the characters and events of the stories depicted, though what instrument goes with what character changes from song to song. Sometimes Pooh is a clarinet, sometimes a tuba. There’s even a credit for “Tiegergitarrrre.” All the compositions are strong and musically interesting, even when the style is corny or silly, with unexpected chord progressions, sudden changes, and glorious incongruities, like surf guitar with accordion and a tuba for bass. I’m reminded of the great music from the classic Warner Brothers cartoons, though this is not as frenetic for the most part, a bit more laid back, as befits Pooh’s personality. Quite a contrast with the music we’d get for an American soundtrack, which would no doubt be by either Elton John or Randy Newman and utterly without surprises.